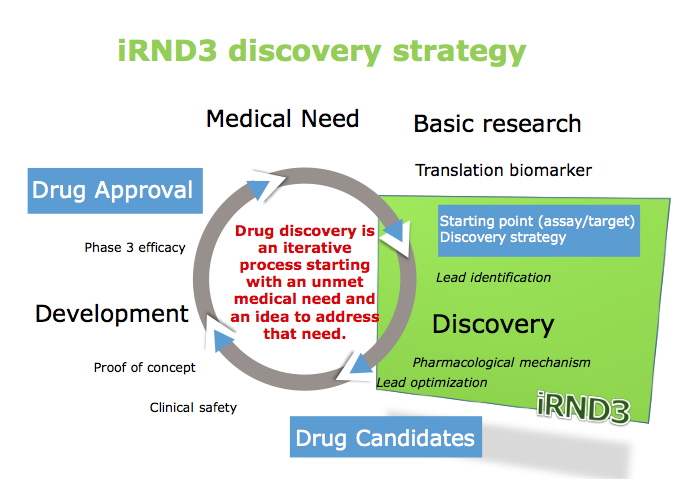 iRND3 focus is on the discovery phase (green). The approval of a medicine to treat an unmet medical need involves an iterative cycle of testing and learning. This figure describes some of the important phases in the process. The process of discovery and development of a new medicine is initiated in response to an unmet medical need to treat a disease. Physiological, genetic and chemical knowledge provide an understanding of the disease. This knowledge will lead to the identification of translation biomarkers that are used to evaluate the effectiveness of a potential medicine. The available knowledge informs drug discovery strategies which are used as starting points for the practical process of discovering a new medicine. iRND3 uses this knowledge to inform its lead discovery strategies. The lead discovery strategies are used to identify new medicine candidates. A candidate molecule will then be tested for proof of concept in predictive models of disease. The candidates that are effective in the disease models will be optimized for biopharmaceutics properties and safety to provide a drug candidate ready for clinical studies in humans. The left hand of the circle (from 6 to 12 o’clock) is the development phase of drug discovery which involves testing for safety and efficacy in humans leading to registration. Multiple iterations are generally required before a medicine with sufficient efficacy at a safe dose is discovered, tested in humans and registered.